LongSon MuiNe Backpacker Paradise i Mui Ne, Vietnam : Boka nu! The property is right on the beach and has plenty of space to relax, LongSon MuiNe Beach Campground Resort is located between the White sand dune and Red sand dune. 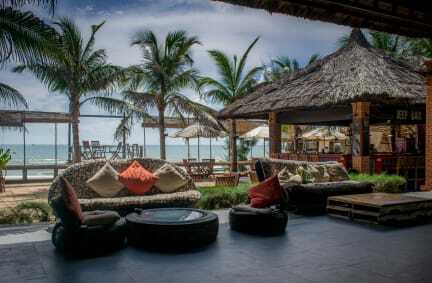 It is 10km from Mui Ne Town, 20km from Mui Ne Central, 30km from Phan Thiet City. 250km from Ho Chi Minh City. You will find a shop, Laundry, Bus tickets, Tours and Board Surfing at the property. You can play pool at the resort and enjoy daily activities. 24 hours Reception, Bar and Restaurant. The restaurant serves Vietnamese and International dishes. We have daily $1 drink and snack deals and Friday camp tent are $1. Local Bus available from 06h00 to 20h00 to go to Mui Ne Town, Mui Ne Central, Fishing Village, Red Sand dunes and Phan Thiet City. This property is also rated as the best value in Mui Ne! Guests are getting more for their money when compared to other properties in this city. Free cancellation on every booking! Very good atmosphere! Fun things going on everyday, so you will not get bored. Nice and quiet and the staff were amazing!! Super-friendly and they always tired to help. Sleeping in a tent was the best of my trip! Don't hesitate to go here!! Cool hippie vibe. It sort of felt like I walked into a scene from ’The Beach’ which was pretty cool. Super chilled out place. Staff is just amazing. Nice music for a change. We only tried the veggie burger from the restaurant but it was great, lots of veggie options if you’re into that. This place is definitely an experience on it’s own. 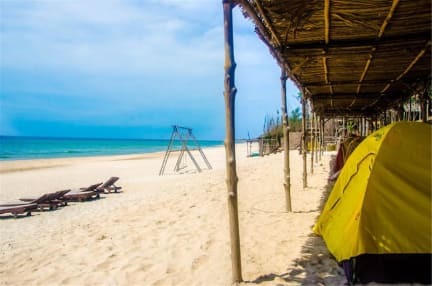 If you’re in Mui Ne give it atleast a night and experience sleeping in a tent to the sounds of the soothing waves from the beach just a few feet away. The place in it self is super cool but it’s location is a bit off. There’s really nothing close to the hostel so you would have to rent scooters / take the bus to get around. All in all I had a nice stay and the AC dorm felt like good value for the money. Would recommend. Skönt häng och stranden är riktigt bra. Bra gemenskap med aktiviteter på kvällarna. Väldigt bra atmosfär. Dock väldigt förvirrad personal. De maträtter jag åt var goda men såklart lite dyrare än för det är en resort. Mui Ne centrum finns inte så mycket så skulle definitivt bo här igen. It's nice to be able to sleep in a tent and really close to the beach. The staff were friendly but not so outgoing, felt like we were in the way all the time and not a hundred percent welcome. But nice place with cool facilities. Stayed on this hostel for one night and it was terrible. The dorm is outside so it makes it impossible to sleep. But most of all, I had one meal in the restaurant and I got food poisoned. Do not stay at this hostel if you want to sleep and being able to eat.